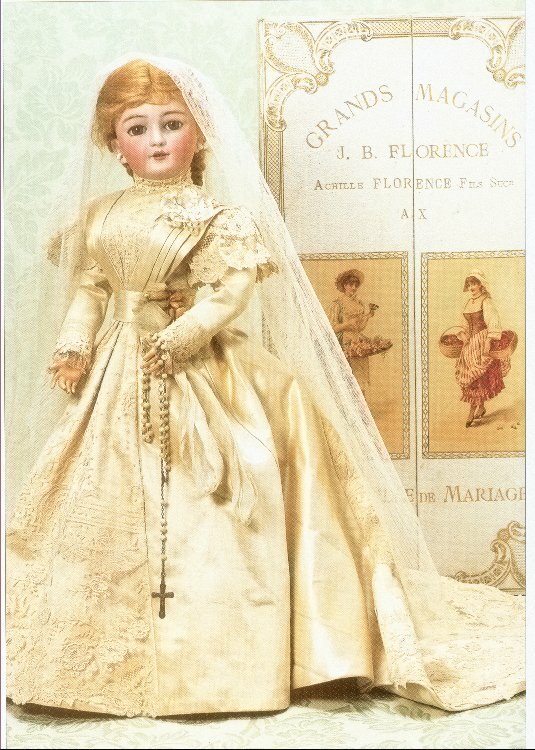 The original doll. Here's the original Simon & Halbig bride as pictured in Theriault's July 16, 2000 catalog, "Blowing Bubbles, Skipping Stones." She came with her original box and was in pristine condition. She sold at the auction for $5,400. My Millie-winning reproduction. 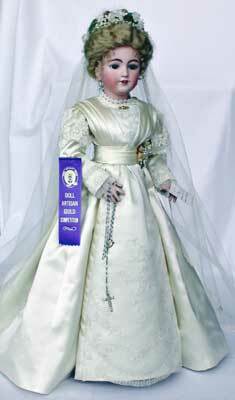 Here's a full view of the front of my Millie-winning bride. 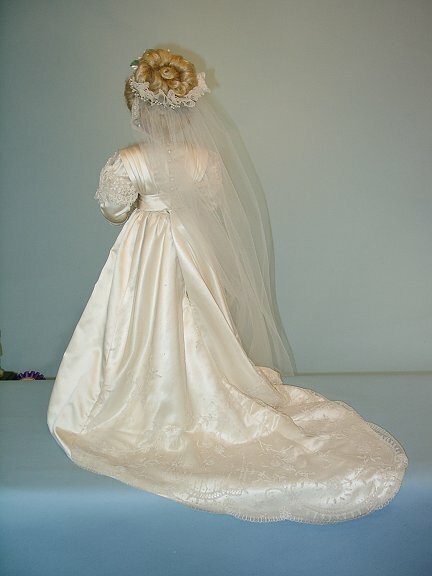 Her dress is of ivory silk satin with a gorgeous vintage lace overlay in the front panel and long back panel train. Her bodice and skirt are separate. The skirt is a five-gore skirt with a train in back (see other pictures). The front panel has hidden buckram strips sewn across it for support so that it drapes properly and shows off the vintage lace. The bodice has pleated bretelles and a pleated waist. 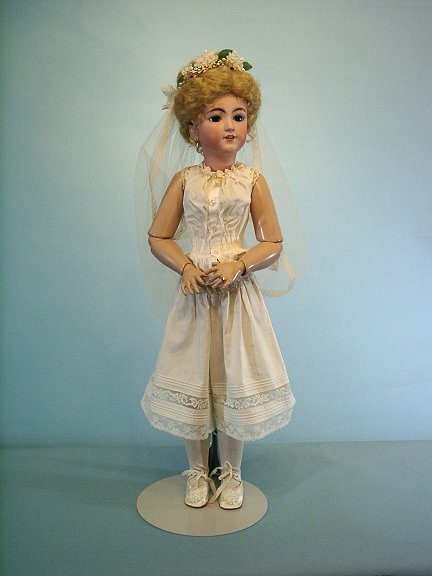 She has lace cuffs on the bodice and short lace cap sleeves over the longer ones. She is carrying a child's rosary that is just the right scale. At her waist and in her hair are wax flowers and buds. I did those myself using a little acrylic paint for the vintage look and dipping the flowers and buds in melted wax. A little messy, but so effective with her costume. 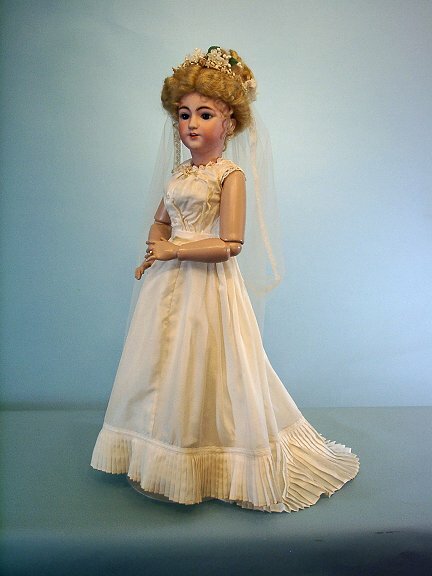 Her hair is a mohair wig that's been restyled in the Gibson Girl style so popular at the time. She's wearing a small "diamond" ring on her left ring finger. Close-up of my reproduction. The Simon & Halbig 1159 lady doll was painted in two different ways. In the earliest version of the doll, both top and bottom eye lashes were painted. 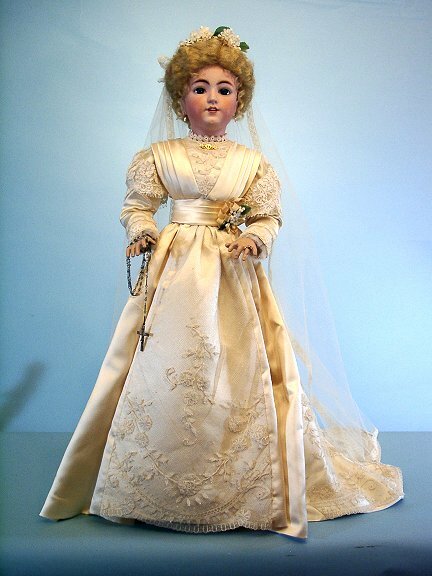 In the more common, later version of the doll, only the bottom eyelashes were painted. For the later doll, the sleep eyes had applied mohair lashes for the upper lid. 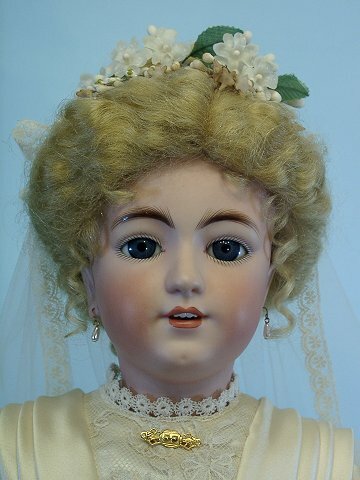 The Theriault's antique doll had only lower eyelashes. Some of the undergarments for my reproduction. 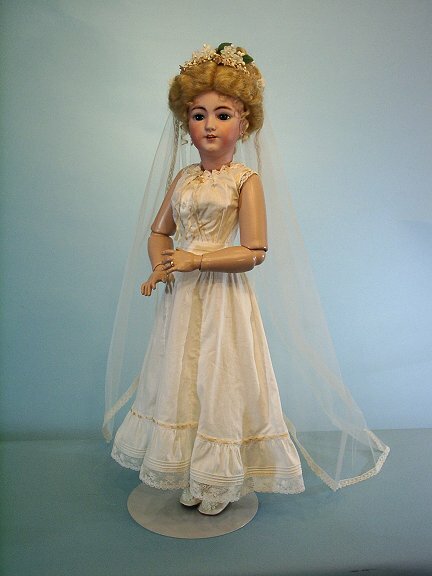 I was on my own in designing appropriate underwear, since I didn't know what the original doll was wearing underneath the lovely bride's dress. I studied many catalogs and magazines from the period and developed a set of underwear that's one of my favorites. The underwear pattern and the dress pattern for this 26" doll is now available! Find more information about these patterns on my Patterns page on this website. You can contact me at suzannesdolls@aol.com or mcbraar2000@yahoo.com to order.